If I were to tell you that I liked a wide variety of music, you’d bet that just about any live show would do. Not true. For me it’s about that perfect match between venue and artist. Let me tell you about last weekend’s struggle to find that perfect match, and how it turned out to be amazing in the end. It started Tuesday as I realized I should get out and go see something. 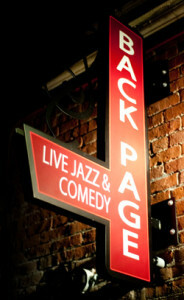 I felt like something jazzy or bluesy, so I Googled “lowell jazz.” The first hit was for Back Page. I didn’t know it, but the website looked clean enough and they had a full calendar. I asked a friend and she said, “Oh, Brian and I love that place!” Sold. Score one for Google and one for word of mouth. But which night should I go? That happens to be the first hit for the Evan Goodrow Band. The music was upbeat and gave me a good vibe. But I didn’t decide then. I wanted to see what others had to say about this group. So after some more Googling, I eventually settled on Evan Goodrow Band as “the show.” Let me just say up front: it was awesome. First, let’s talk about the price. You can’t beat free. There was no cover. I bought a drink from their ginormous drinks list — the kind of list usually seen only in high-end restaurants — but I didn’t have to. And even though I got a J’s Specialtini, I could have had just a beer. Where else can you see a show for the cost of a beer? The atmosphere at the Back Page Lowell was just what I was looking for: dark with reddish lighting, comfortable chairs, central bar. A perfect place to relax. Okay, next let me tell you about this Evan Goodrow Band. When I first watched that YouTube video, it had 333 views. This group should have a hundred times that. The guitar melodies are memorable and catchy. The keyboard sound reminds me of my happy times playing PilotWings. And I don’t know much about their genre, “Neo Soul,” except that I love it: artful solos, upbeat songs, a really fun time. The only sorry part of the whole experience was that there weren’t more in the audience that night hoping to find good music with me. Live music like that is life at its best, and Lowell is full of it, so let’s get the word out. What have been your favorite “hidden gems”? Let us know in the comments below!